In southwest Idaho, the larger part of winter is pretty darn crummy. We get the most terrible inversion that blocks the sun for several weeks, which I literally haven’t seen in at least three. It is cold and dreary, and can often leave one feeling a little down and depressed. So, to counter the drab and colorless winters we experience here, I have to choose a preschool theme that is extra fun and uplifting. Oceans! Oceans preschool theme is the perfect way to keep kiddies cheery and interested. 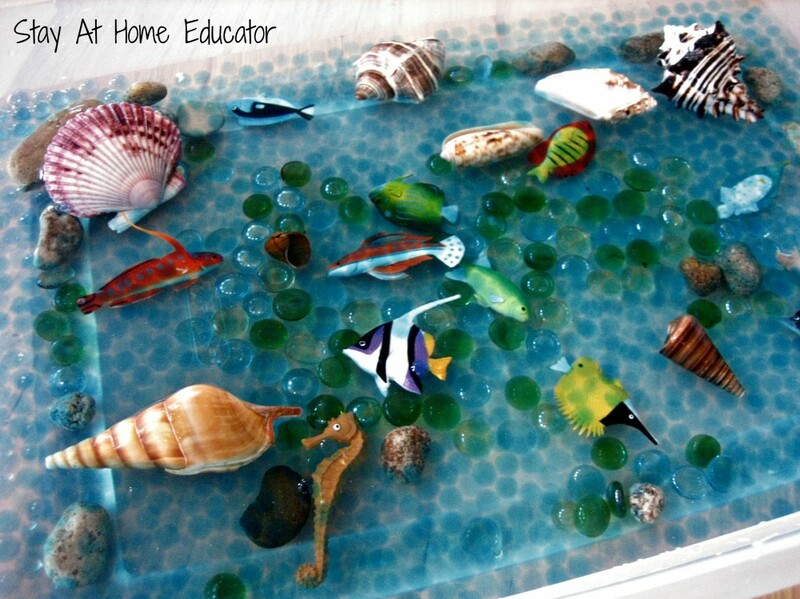 So, today, I’m sharing ten ocean theme preschool activities. If this is your first time, please join me regularly via E-mail in the right sidebar, Facebook, Twitter @StayAtHomeEdu, and Pinterest. For your convince, I have included some of our favorite products related to the ocean. Any purchase of these products goes directly to maintaining this blog. This was by far the most popular activity. The sensory bin is filled with about and inch and a half with water, some blue water beads, blue and green glass pebbles, and some landscape rocks from my neighbor’s yard. (Don’t worry, I asked first. 😉 ) Also, in the bin are some real seashells, and some fish counters . When I first introduced this bin to my preschoolers, I had added a couple drops of blue food coloring, which camouflaged the blue water beads. It made for quite the surprise when the students dove in to play, only to discover there was something small and slippery in the sensory bin. The students referred to the water beads as “fish eggs”, which I found rather fitting. I love the Little Dover Sticker Books . They are such an inexpensive way to make your own nomenclature cards when you don’t want to spend the money on real Montessori nomenclature cards, (or a great option for those of us who are simply too lazy to run to the office supply store to have them printed in color). 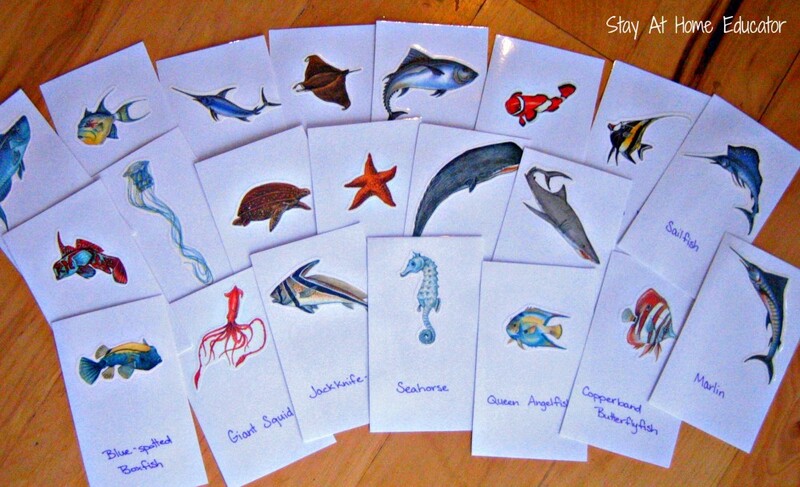 With these cards, we discussed the different attributes of the various fish and animals that are found in the ocean. Some things I encouraged the students to share were details about what the fish looks like, how big it might be, how it might protect itself, and if that fish probably lives in cold or warm waters. After identifying specific characteristics of many of the fish, the students matched the cards with pictures they had seen in the books I’d read to them. I had purchased a wonderful set of large and medium seashells just for our ocean themed preschool unit. When I first introduced them to the students, it was after reading a few books about ocean animals with shells, and I invited the students to use magnifying glasses to take a close look and describe what they saw. William was so excited to see that I had purchased a bag of multicolored goldfish crackers, (a real treat at our house) but he was even more pleased to share them with his preschool friends. 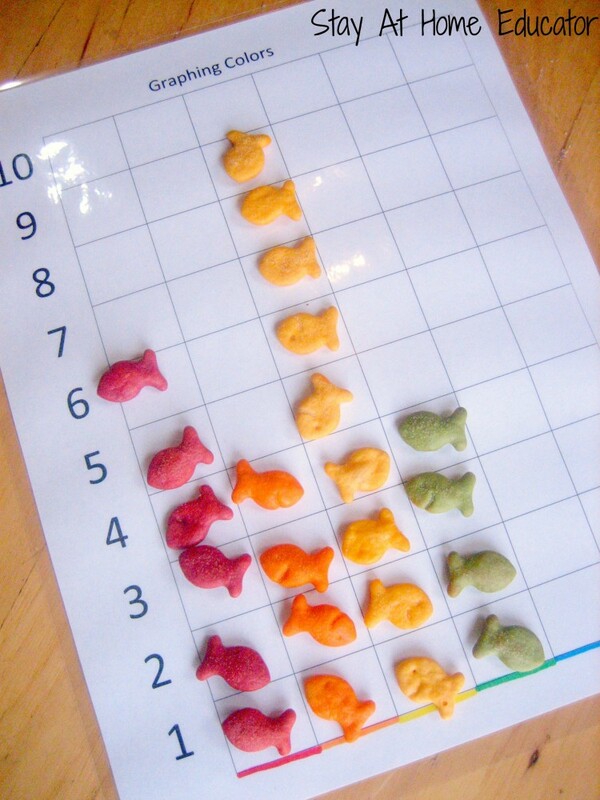 I had made a simple color graph for another math activity, but it also worked well for the students to “record the data” of their cupful of goldfish. Before I allowed the students to eat their math activity, we compared graphs and identified who had the most and least of each color. 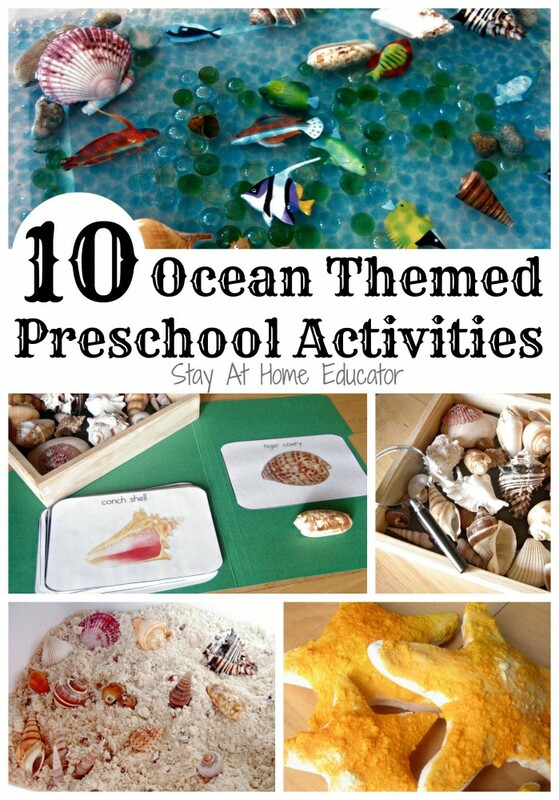 PreK Pages has a wonderful set of ocean activities that also include colored goldfish. I used Rainy Day Mum’s salt dough recipe for this activity, but halved the flour and then added a half cup or more of cornstarch. 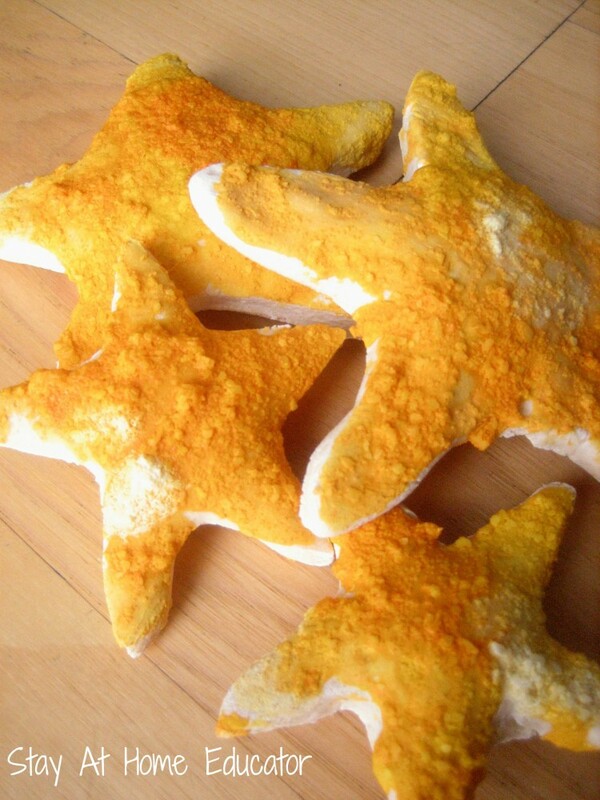 I mention this because the added cornstarch caused the student’s starfish to puff up a bit when baking, giving them a very realistic look. I also added a fair amount of kosher salt to the student’s paint, which gave the starfish a very bumpy and rough texture, much like that of a real starfish. I wanted to demonstrate to the students how octopus defend themselves. Using a small, clear container, I placed a few glass pebbles in the bottom, then filled the container with water. 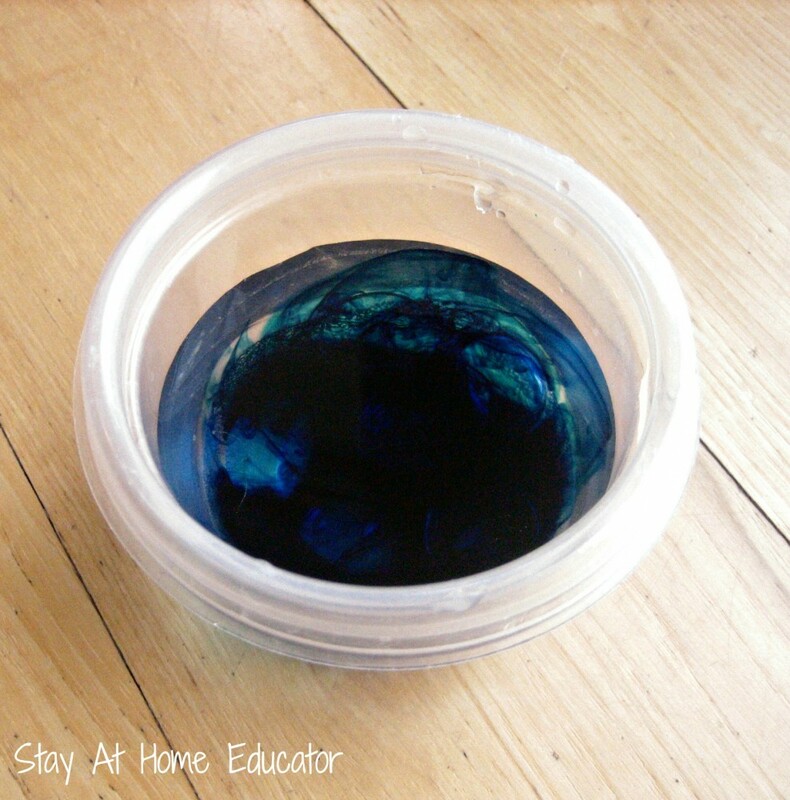 We had read in a book about how an octopus will squirt ink to confuse and blind a predator, so I added a few drops of food coloring to to container of water to help illustrate how shooting ink helps the octopus get away. 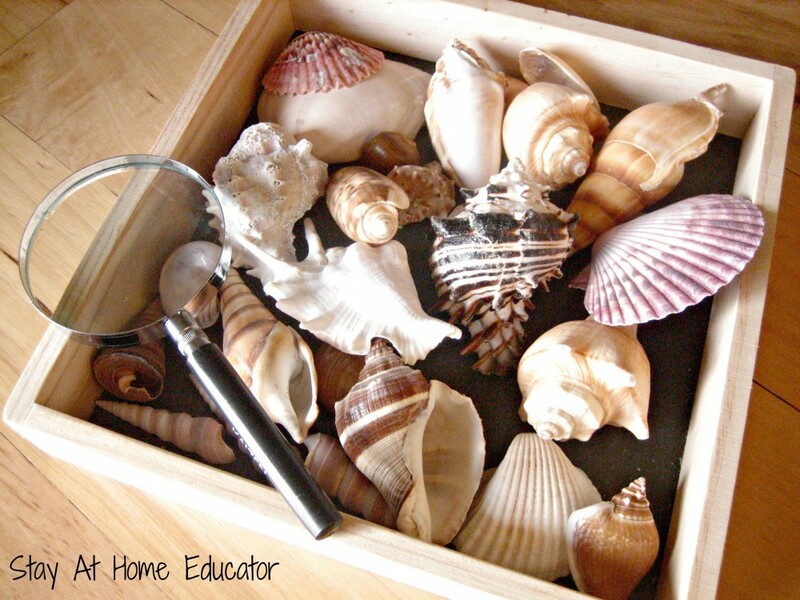 Students enjoyed exploring seashells in this easy sensory bin. I filled it with cloud dough, made up of eight cups flour to one cup oil. Note: the cloud dough will get inside the seas shells, but soaking them in water will remove any cloud dough that cannot be dug out with a Q-tip or toothpick (used by an adult, of course). 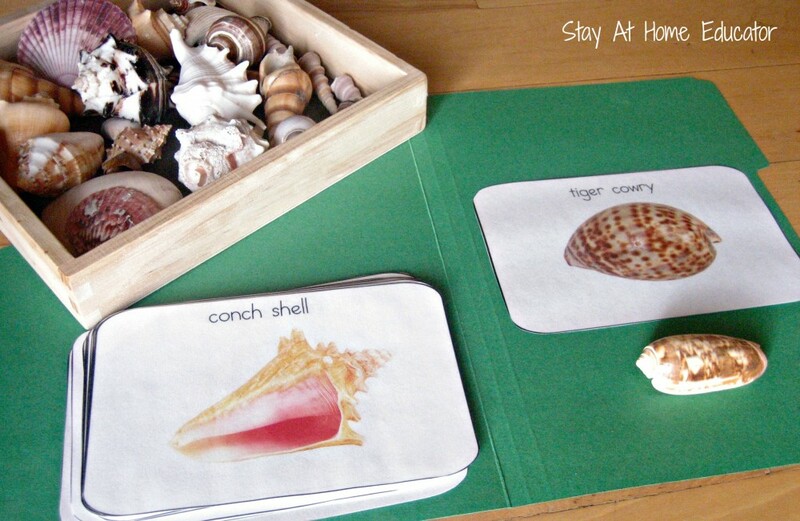 I printed in color these seashells nomenclature cards from The Crafty Classroom. Students matched up real seashells with the correct seashell card. Students made these cute octopuses after reading a book about them. The craft is simple. Students cut eight lines for the tentacles, then numbered each tentacle. Then, students placed hole punch reinforcer stickers each each number on the tentacles to serve as the suckers. So, for the first tentacle, they placed one sticker. The second, two, the fifth, five, and so on. 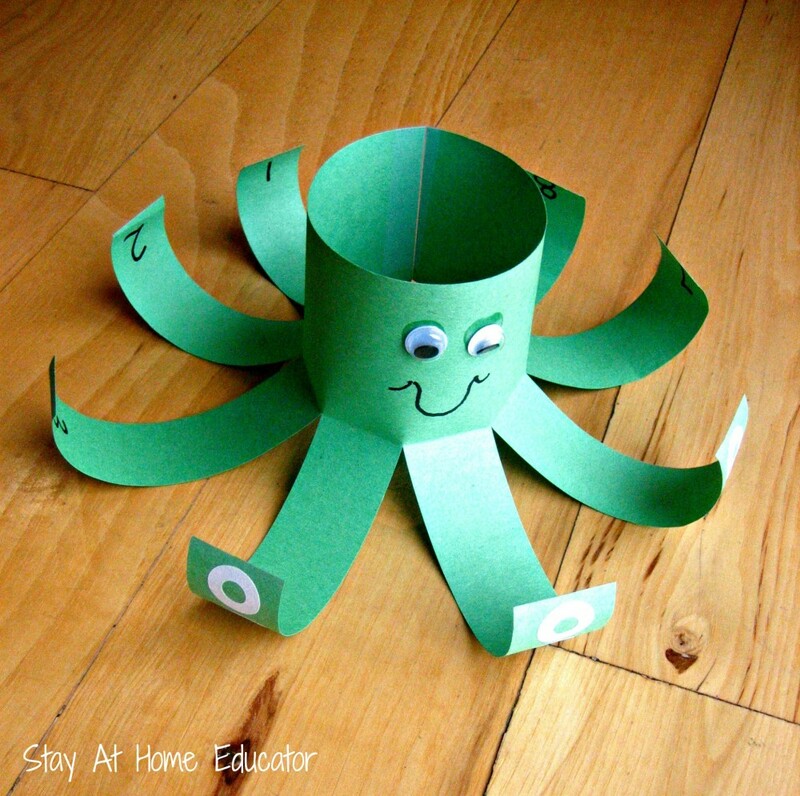 I taped the paper together to for the 3-D octopus, then helped the students curl each tentacle. Students used plastic sea fish figurines to make patterns. After allowing the students to play a bit with the new toys, I began making patterns, and soon the students joined in and began finishing the patterns i had started. Then, I encouraged students to make up their own patterns. Please join me regularly via E-mail in the right sidebar, Facebook, Twitter @StayAtHomeEdu, and Pinterest. Don’t forget to check out my other preschool themes in the right sidebar! Great activities! I love how the salt dough starfish turned out. The kids will surely love doing these activities. Thank you for sharing this activity. 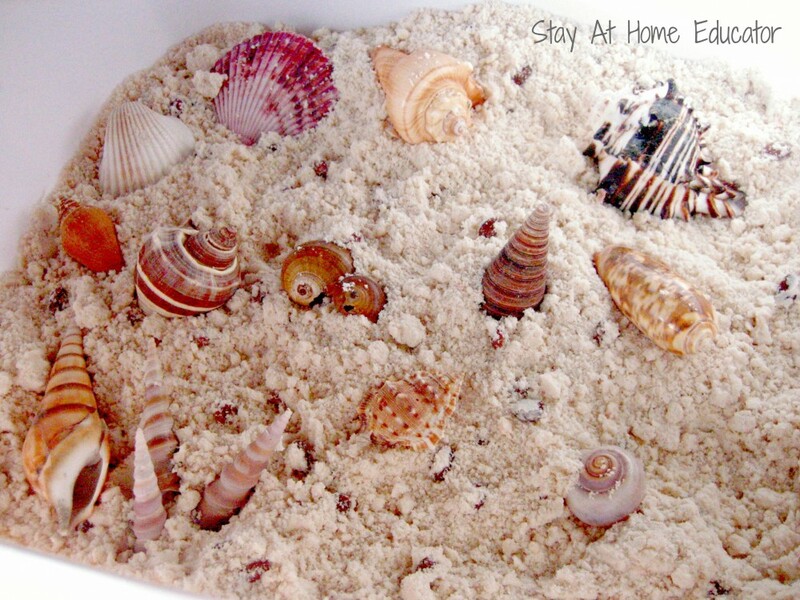 Will try the sensory bin in a few days, I just need to go to the beach and pick some sea shells with my daughter. These are great! Love the cloud dough, the inking demonstration, and the starfish. I love all of your ocean themed activities. Our little ones would love to jump into these learning experiences. Thank you for sharing on Artsy Play Wednesday! These are fantastic ideas! We have been studying sea creatures and the ocean for science all year long. My three children are so fascinated by ocean creatures that we may continue studying it all through next year. I love these activities, especially the nomenclature cards to make using the Dover stickers–fantastic idea! Thanks! My preschoolers also loved them. I’ll be posting more in the next month!